#000487 - The Lord of the Rings, by J.R.R. 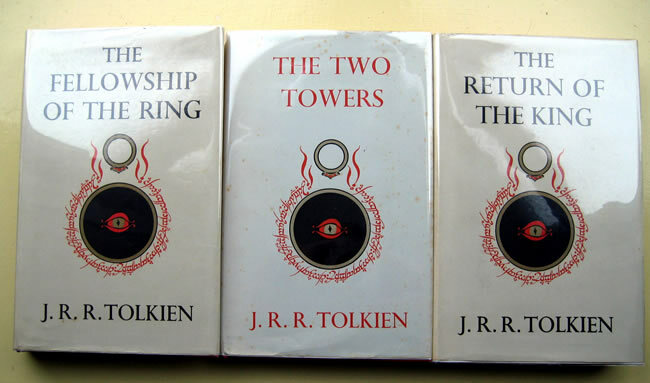 Tolkien - Early 1st Editions 1955, 4th/3rd/2nd - The set is all Near Fine to Very Good Plus, all unclipped, and virtually untanned dustjackets, (very unusual to be this clean and white). The set is all Near Fine to Very Good Plus, all unclipped, and virtually untanned dustjackets, (very unusual to be this clean and white). 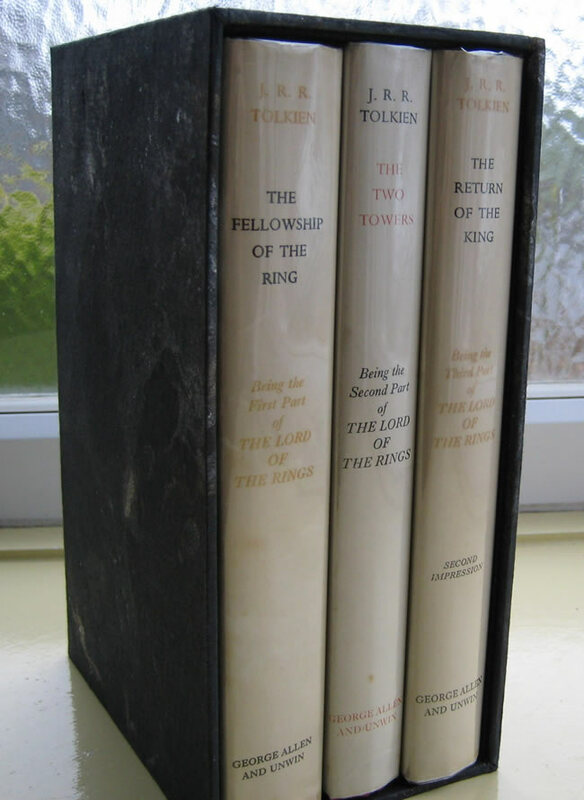 Fellowship of the Ring 1955 Very Good Plus/Near Fine Stated 4th impression in a Near Fine 4th dustjacket. The original dustjacket shows no tanning, slight fading to the red lettering, no loss or wear to the edges. 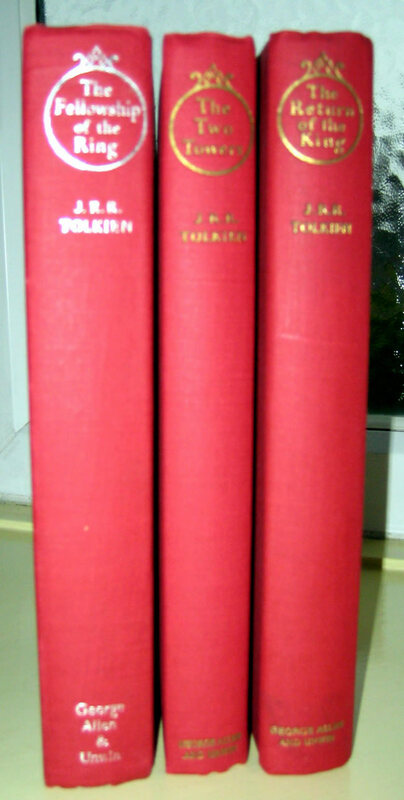 Gilt titles bright with no fading or tarnish, the cloth boards very clean no damage whatsoever, red topstain is not faded, slightest foxing or offsetting to page edges and endpapers, with no names or writing. Map is present and in Near Fine condition, no tear or extra folds noted. The Two Towers 1955 Near Fine Stated 2nd imp. (actual 3rd imp - printers error misidentifies 3rd as 2nd) in its original, Very Good Plus 2nd impression dustjacket, with two 1/2 closed tears, one to the top front edge and the other to the front bottom edge without any further edgewear or loss. Dustjacket is bright, shows no fading, no tanning, and is not price clipped. It does show some minor foxing to the edges and creases of the folds. The textblock is clean and bright, with only light sporadic foxing to the edges and endpapers. 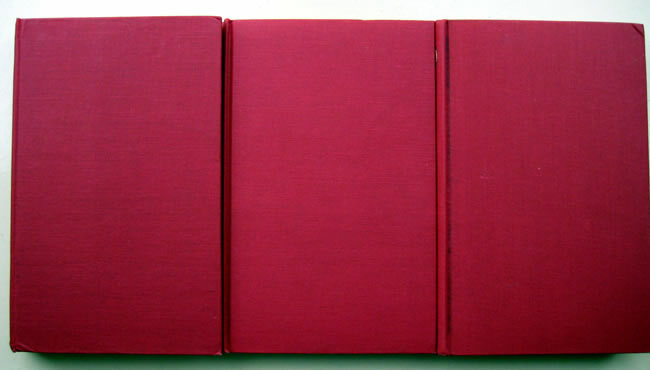 Gilt titles slightly dulled, boards very clean, red topstain slightly faded and dusty, edges show only minor shelfwear. The Return of the King 1955 Near Fine 2nd Imp in a Near Fine 2nd Imp dustjacket. Gilt titles slightly dulled, boards immaculate, with a couple of light bumps to the corners, a faint black mark to the crease on the front of the spine. The red topstain is clean and dark red, no fading whatsoever. Sporadic foxing to edges and endpapers, but no inscriptions or other writing present. 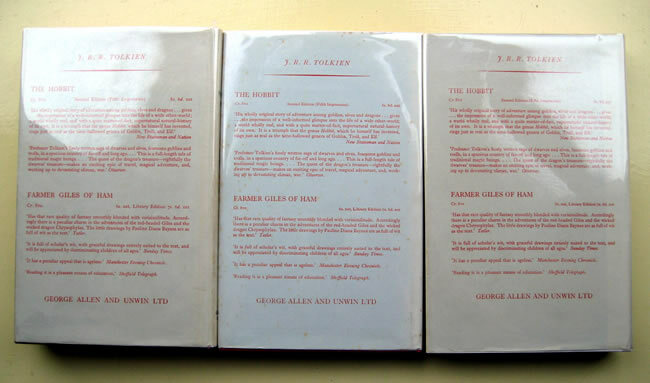 An exceptional set of first editions of this classic of fantasy literature. The original cloth boards are all uniformly clean on all three books. Only slightest shelfwear or bumped edges. Maps are all present, clean and bright, with no tears.